It is the week from Spirits' Day until next Sunday, when healers called "kaloushari" visit people's homes. People believe that after their visit there will be only health. 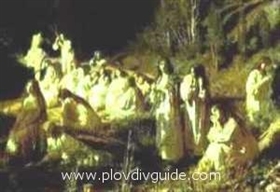 The week after Pentecost/Whitsunday is called Rousalska Nedelya (or "Midsummer Week", or also known as the "Mermaid Week") - it is believed that until the day of the Holy Ghost the mermaids have already done their job on earth – they have sown the seeds of fertility. Houses are decorated with wormwood and young girls put sprigs of it in their bosom, young men in their left pocket, and the children on their neck, in a small cotton bag like a charm amulet. In this way people protect themselves against the mischief of the mermaids. A man never starts alone on a journey on that day for he may lose his mind – get the mermaid disease. And only the mermaids can heal him. The “rousalii” are men who go in groups of uneven numbers (3, 5, etc) the whole week and give people and nature health and fertility. They are dear guests in every house. In Western Bulgaria the rousalii are also called “kalushari”. The leader of the kalushari is called "Vataf" and the position is hereditary – following the male line. It is only the Vataf who is allowed to pick medicinal herbs and only he knows the incantation, which is pronounced over the herbs and the flag. By verbal magic he transmits the magical force of nature to the chosen kalushari. They are young married men, who are healthy and quick, they don’t drink, they are honest and goodhearted, can keep secrets and suffer privation for they may not go back to their homes during the whole Midsummer Week. After each of them has endured the fasting period determined by the Vataf, he is consecrated by the leader and he has to learn the rituals. It is only then that the consecrated kalushar makes an oath before the flag, the mermaid stick and the other kalushars.